Just 15 months after Marc Andreessen and Ben Horowitz officially jumped to the venture capital darkside with the close of a $300 million fund, Andreessen Horowitz is announcing the close of a second $650 million fund. In less than two years, the firm has rocketed up to a whopping $950 million under management, an investment staff of 18 people and a portfolio that includes everything from Skype to Zynga to Foursquare. Is it Marc Andreessen and Ben Horowitz’s membership in the elite club of entrepreneurs who have built and sold two companies for more than $1 billion each? 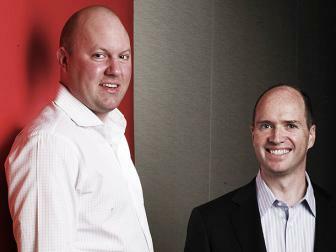 Is it Andreessen’s seats on the boards of Facebook and Hewlett-Packard, two of the most talked about and powerful boards in the Valley? Was it the stellar angel investment portfolio that included a raft of open source, enterprise and Web 2.0 stars and has essentially acted like a deal generation pipeline for the fund? Or was it that the first fund succeeded in grabbing the most competitive deals like Foursquare, but also made some gutsy and, at the time, controversial mega deals like Skype? A mix likely. The biggest feedback from LPs: When they called around to other investors and entrepreneurs doing reference checks remarkably few of them said Andreessen Horowitz acted like assholes. As discussed a few times on my AskAVC show, that’s a rarity in this industry and high praise. Horowitz says half the people he’s told the news to have asked why the fund was so big and half have asked why the fund was so small. The former because it’s a lot of money to raise so quickly in an industry that most people feel already has too much cash; the latter because Andreessen and Horowitz aren’t afraid to do a big, late stage deal if they can get a chunk of a company they love, like Skype. I mean, raising another $100 million might have taken, what? Four weeks? Horowitz says they didn’t go larger because they didn’t want the fund size to dictate their investment pace. They’d rather have to go raise money again if things go better than expected than to have to press to find suboptimal deals. It’s striking how fast the deal closed, because most limited partners are saying they want specialized funds, or firms that invest in just seed, just growth or specific sectors– so they can control their own allocations. Andreessen Horowitz is most definitely not that. “We think that’s wrong, quite frankly,” Horowitz says. “We think the stages vary in quality and pricing a lot over time.” For instance, when the two were doing angel investing in the early 2000s the Web was a space no one would go near except the most determined (read: crazy) people, who typically make the best entrepreneurs. The two got in a ton of great deals for cheap. But today with the glut of seed stage deals and lower overall quality of the entrepreneurs, Horowitz says the venture stage is a better vantage point to be competitive on price and pluck up companies that are already demonstrating traction. Horowitz also argues the blended fund strategy is a better deal for limited partners. Several leading Valley firms have branched out into late stage or emerging market funds in recent years, and LPs who couldn’t get their money into the early stage fund before rushed at the chance to get closer to the firm. But if the early stage fund gets a home run, but the late stage or emerging market funds do horribly, only the LPs in the early stage fund make money– well, along with all the venture firm’s partners. If an LP is in both, he has to pay the carry on the fund that did well, while losing money on the other one. In many ways this approach of sticking with a company all the way, harkens back to the early Don Valentine, Arthur Rock, Tom Perkins days of venture capital. Andreessen Horowitz doesn’t believe in just one partner being assigned to a startup, they hire a lot of experts and they’re all up for grabs. Some make sense when you need help recruiting engineering talent and some make sense when you are looking to go public. Continuity is an underrated asset, Horowitz says. When you rotate board members in-and-out, weird, reactionary decisions can result. People brought in to help later don’t know the entrepreneur and the company’s history as intimately. A missed quarter’s numbers may call a new board member to call for a founder’s head, but a board member who’s been with the company longer may know more context or what a better role for him might be. It’s no wonder the guys are said to have such an affinity for the show “MadMen.” Their firm is a throwback to venture capital’s classic, glory days.